Playtime may be the 'rocket fuel' of child development, but it's fast becoming the privilege of the few. We must equip our children with the skills and tools to address and embrace the new realities of tomorrow. To do this, we must allow them to develop through play. Play is the freedom for children to engage with and learn from the world that surrounds them. How did you play as a kid? With blocks or chess pieces? Building sandcastles and jumping rope? Or examining bugs in preschool and making slime in science class? If so, you’re lucky. Play helped develop the cognitive, emotional and social intelligences that you rely on now. Whether alone or with others, with toys or in imaginary worlds, play allows children to make the most of the unique developmental opportunities that come with childhood and carry those skills throughout their lives. We know play is the rocket fuel of child development. That’s why we – IKEA, the LEGO Foundation, National Geographic and Unilever – came together in 2018 to form the Real Play Coalition with a shared vision: to promote play-based opportunities that develop a breadth of skills for optimal child development. Today, we’re increasingly seeing a “play gap” around the world, with time and space to play influenced by socio-economic status and gender. Last November, the coalition published our first study shedding light on low-play and play-poverty in the looming skills crisis. Time to play is under threat. A decline in the number of community play spaces in an urbanized, world coupled with parental safety concerns is reducing opportunities for outdoor play, too. In the United Kingdom, time playing outside has declined by 50% in a generation. One in 10 children don’t get any outdoor play. All over the world, children are spending less and less time playing in favor of traditional academic learning, which is starting earlier and earlier. Schools are now more pressured and offer less playful experiences, as their focus shifts towards testing and examination, with preschool programs including more didactic components than just 20 years ago. The study also found that one in five children self-declare that they are “too busy to play”. This year, we’re taking it one step further to pinpoint and analyze the gaps in access to quality play with the development of the world’s first-ever Play Gap Report, created in partnership with University College London. 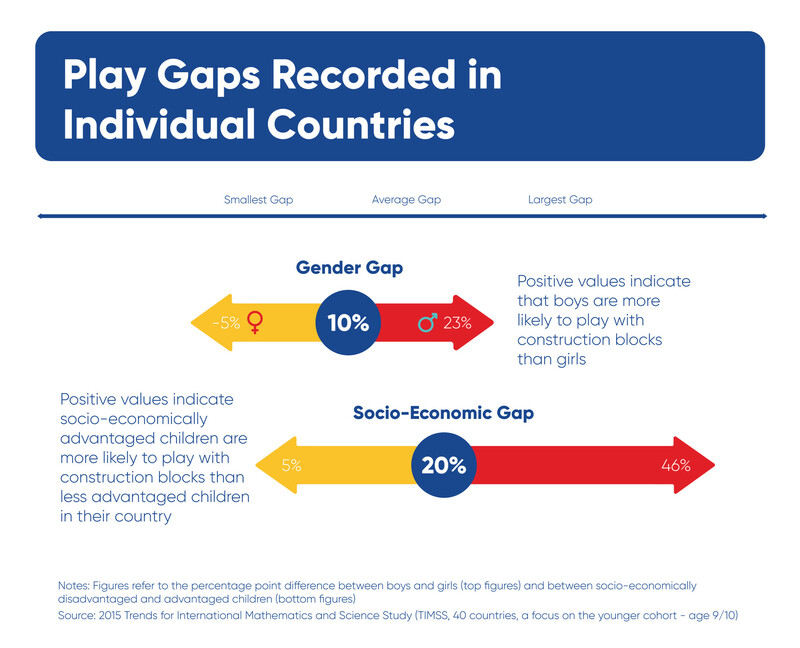 The Play Gap Report – to be fully published later this year – is a global study to help identify and qualify the play gaps, already demonstrating the profound and alarming gaps in play by gender and socio-economic factors for children across 70 countries. Preliminary results show that children from disadvantaged backgrounds are 20% less likely to play with blocks, and 11% less likely to sing songs with their parents. In fact, children from high socio-economic families are 10% more likely to engage in all types of play recorded. Gender matters, too. Five-year-old boys are much more likely to engage in playing with construction blocks play than girls of the same age. Research shows a strong link between construction block play and the development of language, motor and early math skills. Yet in Scandinavia, the difference in block play for boys and girls is more than 20%. These play barriers have far‐reaching implications: fewer play moments every day means fewer opportunities to develop the range of skills children need to thrive in the dynamic, challenging economies of tomorrow and the realities posed by Globalization 4.0. The play gap must be part of the discourse on inequality and education as we work to address the Sustainable Development Goals and focus on the future of jobs and skills. The Real Play Coalition is committed to ensuring children around the world benefit from the power of play to develop the vital skills they need to succeed in a world reshaped by the Fourth Industrial Revolution. We hope to raise awareness and change perceptions around the value of play. With networks spanning the globe and a presence in many people’s daily lives, the coalition’s members have a responsibility to help tackle the issues and reclaim play as a path to happiness, connection, escape, learning, self-expression and discovery throughout life. Among the coalition, we’ve dug in mud, created imaginative landscapes out of pillows, and pulled apart radios only to put them right back together again. These experiences built on our collaboration and management skills, and our ability to think creatively and out of the box. Our and tomorrow’s generation must adapt to the new world, as machines and artificial intelligence fill more of the workforce. Right now, our children need to be strengthening the skills they need to work productively with technology, focusing on collaboration, creativity, and communication. Without your own childhood play, would you be the leader you’ve become? Most likely not. We were fortunate to play, and we are committed to ensuring the same opportunities for the next generation. Together, we can give our children more time and space for quality play, reduce the Play Gap, and empower them to change the world.